It's nice to be near the ocean, but Charleston, South Carolina, is as flat as a pancake, so I have to escape to the mountains regularly. Looking down on vast misty valleys and shimmering lakes from a trail in the Pisgah National Forest awakens a certain feeling of inspiration. Maybe it's my Scottish Highlands blood. It's more fun to get out of the comfort zone of the trails I know and explore the unfamiliar, so I might get a trail map from the outdoor shop in Brevard, North Carolina. A hiking guide shows where to find good trails and the general nature of each hike, but it's nothing like smelling the trees, hearing the wind whistling through the trees and wondering if it's a bear with those heavy footsteps in the bushes. Regardless, it helps create a great trip, whether for an overview of a general area to explore or to plan more specific point-to-point experiences. A map can also help motivate a team to grow a company by leading customers to great experiences. The 6 Levels of the Aligned Team (6LAT) model is such a model. It isn't a substitute for direct experience any more than the hiking guide is, but it can similarly help create a great journey by charting a course. Distinct strategies address each level to bring an organization into alignment. A misaligned level will affect all the levels beneath it. If the conductor of a symphony has a seizure, it doesn't matter whether or not the second seat violin is out of tune. And positive changes at a higher level can wash down the levels below like a waterfall after a heavy rain. An aligned team in a business works together more congruently with a common mission and values that answer the "why" behind the goals. Energy that could have been wasted on internal friction like an engine running with no oil can be recovered and focused on serving customers at a higher level. Tony Robbins speaks of how congruent people naturally radiate because they are living in accordance with their values and dreams. Similarly, companies that are congruent through alignment radiate specialness. An aligned team works together with not only shared goals, but also the deeper rapport and congruence that comes from shared mission, values, and beliefs. Aligning an organization with values like these chosen collaboratively with the team helps the organization flow with the river of life instead of swimming upstream. Which principles are behind your ideal of excellent service to your customers? Do your people see how their highest internal values align with those of the company? The mission tells how the organization distinctively expresses timeless principles by enriching the lives of its customers. Making money itself is not a compelling mission because it is inwardly directed as opposed to outwardly directed. Just focus on that and you'll make less money because people can smell they are being used for another's end. On the other hand, people are likely to willingly give the energy exchange of money to a business that is focused on helping them. What's the highest calling behind what your company does? Mental Models can also be known as "belief systems" but in this context I prefer the more malleable connotations of the term "Mental Models." What are the assumptions, the presuppositions behind how your company does things? Shifting a mental model can be a powerful leverage point for breakthrough growth. The challenge is uprooting these assumptions and bringing them to light so you and your team can ask questions like "how else can we think about this?" What skill sets do your people need to fulfill the mission? What digital resources does your company need to stretch the mission fulfillment? Should there not be ongoing training and education programs? Where will stretching capabilities in any of these areas enhance the special benefits offered to your customers? Is continuous improvement a guiding principle for your organization? What are the processes that drive the business? Are they documented so they can serve as a baseline for ongoing improvement? How do shifts in principle orientation, mission, mental models, and capabilities suggest the need to evolve these practices or replace them with new ones entirely? The natural outcome of getting alignment through these levels is measurably improved and more harmoniously obtained results. Instead of pulling and pushing people with the carrot and stick, this flow helps evolve performance, which is driven by the intrinsic motivation stemming from your team's personal values and mission aligning with that of the company. A performance by a great jazz improvisational group can illustrate the levels. Their common mission of deeply moving creative expression is guided by principles like creativity, excellence, and spontaneity. The musicians share common mental models like the 12 note scale and various rhythmic patterns. They have refined their capabilities of utilizing those models with dedicated practice on the instruments. They apply the capabilities in the process of creating great music in the moment. One result is likely to be an appreciative audience. Peak performance in such a system comes from the harmony and collaboration between the high-performing players so the whole becomes greater than the sum of its parts. The music is enriched by how they listen and respond to each other. Defining these things sets up a roadmap that becomes alive with an ongoing implementation strategy. What feedback loops best reinforce the values and mission of the organization? How can leadership align with these visibly and how can people use them for decision making? How will feedback correct course if and when people stray from these principles? Is management brave enough to sacrifice an easy short term result for a principle? In an interview, Charles Garfield, author of Peak Performance and Peak Performers, said "The mission of the individual needs to align with the mission of the team, which needs to align with the mission of the organization. In fact, I would take it further -- the mission of the organization needs to align with the mission of the society in which it is embedded and the mission of the planet to which we are all indebted." 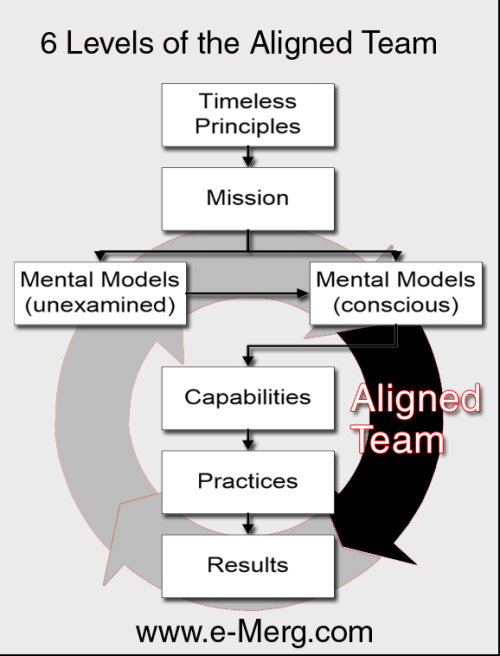 The Aligned Team model is derived in part from the neurological levels model of Robert Dilts, who wrote in a Brief History of Neurological Levels, "Our brain structure, language, and social systems form natural hierarchies or levels of processes....The concept of logical levels of learning and change was initially formulated as a mechanism in the behavioral sciences by anthropologist Gregory Bateson, based on the work of Bertrand Russell in logic and mathematics."